The development of new pulse-sequence techniques, contrast mechanisms, and hardware for magnetic resonance (MR) imaging of the lung and MR-guided focused ultrasound of the brain. 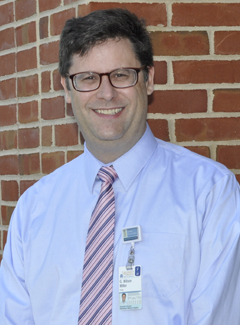 Since arriving at the University of Virginia in 2001, Dr. Miller’s main research focus has been hyperpolarized-gas MRI of the lung, using both helium-3 and xenon-129. Upon inhalation, these non-radioactive contrast agents not only allow us to visualize the ventilated lung airspaces with unprecedented detail and resolution, but offer other forms of contrast as well. PAO2 Mapping: Because the decay rate of hyperpolarized magnetization is directly proportional to the oxygen concentration in the lung airspaces, T1-weighted imaging of inhaled xenon-129 or helium-3 can be used to measure the partial pressure of oxygen in the alveoli (PAO2). The primary function of the lung is gas exchange, and PAO2 is a quantitative physiological parameter that is directly sensitive to the exchange of oxygen between inhaled air and the bloodstream. Dr. Miller is currently exploring the use of fast spiral pulse sequences to generate three-dimensional, whole-lung PAO2 maps in a single short breath hold, for use in patients with lung disease. Diffusion-Weighted Imaging: Individual gas particles undergo random Brownian motion as they bounce around inside the lung airspaces. Diffusion-weighted imaging of inhaled hyperpolarized gases measures this random motion, and is sensitive to the degree of restriction imposed by the fine alveolar structure. Research in this area has centered on the development of fast diffusion-weighted pulse sequences that can detect alterations of the lung microstructure caused by emphysema and other diseases. Respiratory Motion: Grid-tagging of inhaled hyperpolarized gases can be used to track how the different parts of the lung move with inhalation and exhalation. In collaboration with researchers from Radiation Oncology, my group has pioneered the use of this technique to study the way the lung moves during free breathing, in an effort to reduce the radiation exposure of healthy tissue during lung cancer treatment. RF Coil Development: Imaging these gases requires custom transmit/receive radiofrequency (RF) coils tuned to the helium-3 or xenon-129 resonance. Dr. Miller runs the research division’s RF coil laboratory, where an assortment of custom RF coils have been built for imaging human and animal lungs. Hyperpolarization Technology: Dr. Miller’s lab recently partnered with Gordon Cates’ research group in the physics department, to build a new helium-3 hyperpolarizer based on hybrid rubidium/potassium spin-exchange optical pumping. This device generates 2.6-liter batches of 50-65% polarized helium-3, and currently supports a variety of human imaging studies in our research group. Also known as high-intensity focused ultrasound (HIFU), MR-gFUS is a noninvasive surgical procedure that can be used to destroy tissue at precisely targeted locations inside the body. This technology is in the early stages of clinical application, but could someday become the preferred surgical intervention for neurological disorders such as Parkinson’s disease and essential tremor, and replace radiation treatment or surgical resection for many forms of cancer and other invasive growths. Research in this area is primarily on the MR-guidance side. Current projects include the development of ultrashort-echo-time (UTE) pulse sequences for high-resolution 3D imaging of the skull, and for thermometric mapping of ablative sonications in cortical and trabecular bone. Dr. Miller also collaborates with Dr. Richard Price in the Department of Biomedical Engineering on his group’s use of ultrasound-activated microbubbles to deliver drug-bearing nanoparticles across the blood-brain barrier. Dregely IM, Mugler JP III, Ruset IC, Altes TA, Mata JF, Miller GW, Ketel J, Ketel S, Distelbrink J, Hersman FW, Ruppert K. Hyperpolarized xenon-129 gas-exchange imaging of lung microstructure: First case studies in subjects with obstructive lung disease. J Magn Reson Imaging 33:1052-1062 (2011). Mugler JP III, Altes TA, Ruset IC, Dregely IM, Mata JF, Miller GW, Ketel S, Ketel J, Hersman FW, Ruppert K. Simultaneous magnetic resonance imaging of ventilation distribution and gas uptake in the human lung using hyperpolarized xenon-129. Proc Natl Acad Sci 107:21707-21712 (2010). Miller GW, Mugler JP III, Altes TA, Cai J, Mata JF, de Lange EE, Tobias WA, Cates GD, Brookeman JR. A Short-Breath-Hold Technique for Lung pO2 Mapping with 3He MRI.Magn Reson Med 63:127-136 (2010). Cai J, Sheng K, Benedict SH, Read PW, Larner JM, Mugler JP, de Lange EE, Cates GD,Miller GW. Dynamic MRI of Grid-Tagged Hyperpolarized Helium-3 for the Assessment of Lung Motion During Breathing. Int J Radiat Oncol Biol Phys 75:276-284 (2009). Wang C, Altes TA, Mugler JP III, Miller GW, Ruppert K, Mata JF, Cates GD Jr, Borish L, de Lange EE. Assessment of the lung microstructure in patients with asthma using hyperpolarized 3He diffusion MRI at two time scales: Comparison with healthy subjects and patients with COPD. J Magn Reson Imag 28:80-88 (2008). Miller GW, Carl M, Mata JF, Cates GD, Mugler JP III. Simulations of short-time diffusivity in lung airspaces and implications for S/V measurements using hyperpolarized-gas MRI. IEEE Trans Med Imaging 26:1456-1463 (2007).